Hi everyone! Updating my blog while "on the road" isn't as easy as I thought it'd be :( I did take some pictures on Friday, so do know that I haven't forgotten about you all! But before I can upload and edit the pictures, I figured I'd post a feature since I have a couple of these ready already. 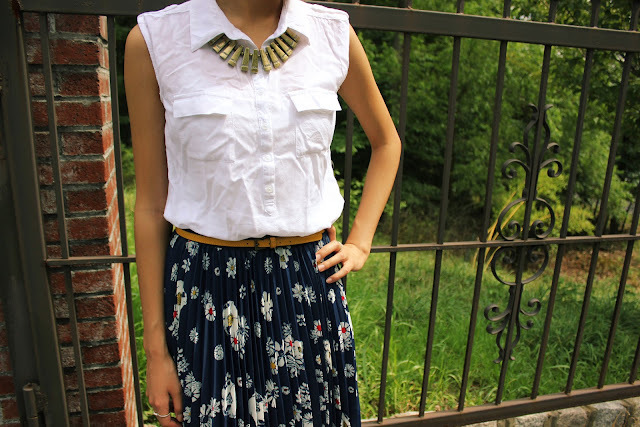 I think this is a perfect summery outfit - it's a bit preppy and every bit girly :) I love the accordion-pleated skirts, and this one's a bit different and more fun since it has a nice floral print to it. If you girls are familiar with the Jason Wu collection that came out for Target, this was one of his prints that he used for this skirt, a dress, and also another tank top. The colors in this outfit are pretty basic, the only accent being the yellow belt which was paired to match the yellow in the skirt. When you wear more simple outfits, that's when you can go with a bolder lip or eye look. In this case, the lip color is almost like another "accent" in the outfit/look because it pairs up really well with the reds in the skirt. Check back soon for some updates on my vacation adventures! And as always, thanks for following! !